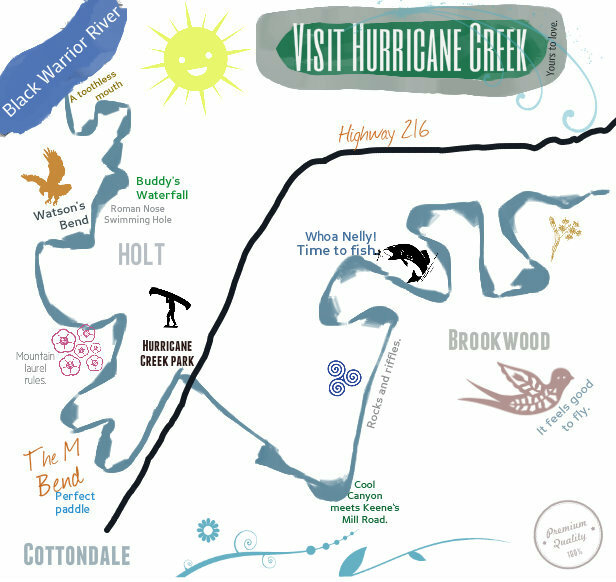 As a woodland stream, Hurricane Creek and its tributaries host an abundance of trees which provide integral food, shelter, and organic matter for the creek ecosystem and its species. Back in the late 1800's when Roland Harper was first mapping the plants along Hurricane Creek, the area was characterized by longleaf pines. Today, these longleafs are gone and have been replaced by loblolly and shortleaf pines. The riparian canopy refers to the vegetation and plant life at the canopy, or top-level, of the ecosystem. For a woodland stream, this riparian canopy cover is critical to the health of the aquatic species in the stream. 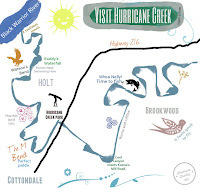 It serves to keep water temperatures from rising past the levels which sustain creek life by providing shaded portions of stream and lessening evaporation. Leaves falling from the bordering woodlands provide a stream with an important input of nutrients. This plant litter provides energy for the detritus-consuming organisms at the base of the trophic web, or food web. A stream's "integrity" depends on the maintenance and survival of trophic webs. The riparian buffers is the vegetated areas next to the stream that protects it from nonpoint source pollution, provides bank stabilization, and offers aquatic and wildlife habitat. The buffer zone also acts as a natural filter for the stream. After a heavy rain or during stream flooding events, waters flooding out into the riparian buffer zone may also be cleansed of sediments, nutrients and toxic materials as a result of particulate trapping and the binding of materials on the leaf litter and soils within the riparian buffer zone. 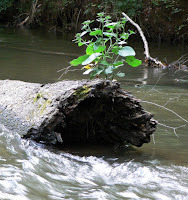 Large woody debris is a general term referring to all wood naturally occurring or artificially placed in streams, including, branches, stumps, logs and logjams. Almost all large woody debris in streams is derived from trees located in the riparian corridor. 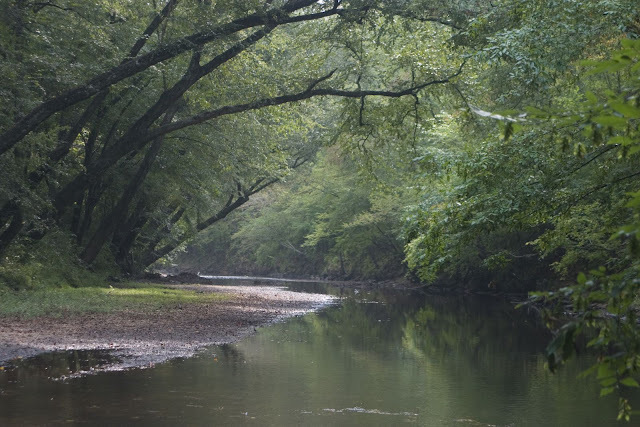 Streams affected by urbanization, agriculture, development, or clear cuts often lack a sufficient quantity of the large woody debris necessary to maintain an ecologically healthy and stable ecosystem. Streams with adequate large woody debris tend to have greater habitat diversity, a natural meandering shape and greater resistance against high water events. Ultimately, large woody debris is an essential component of a healthy stream's ecology and is beneficial. So think twice before clearing that stump from the stream. Learn more about large woody debris from this handout from the Ohio Stream Management Guide. 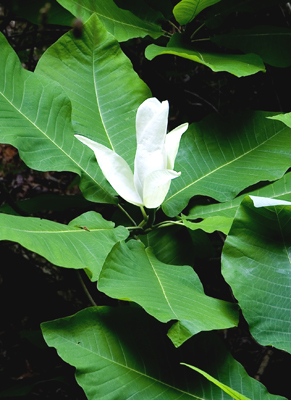 The big leaf magnolia, also known as an "umbrella tree", is a deciduous magnolia native to the southeastern United States and eastern Mexico. This species boasts the largest simple leaf and single flower of any native plant in North America. It is a special species with particular needs. Bigleaf magnolia is found in rich mesic woods; any disturbance that lets more light reach the ground is beneficial to the establishment of bigleaf magnolia, but despite its relatively fast growth-rate when stimulated by more light, other understory and canopy trees/seedlings are usually able to outgrow and out-compete it. This suits the plant just fine as it is tolerant of low light levels. Natural regeneration is quite limited due to the scarcity of mature, seed-bearing plants and the fact that this tree's population mostly consists of widely scattered individuals. In addition, this species is plagued by poor seed set (most likely from limiting factors mentioned above) and low seed viability. Image credit goes to John Wathen. The ironwood tree has a trunk that looks like sinewy muscles and a rounded crown of slender, spreading branches. Its leaves are ovate or elliptical and sharply double saw-toothed with many parallel side veins and short, hairy leaf stalks. Leaf color is a dull, yellow-green which turns to a warm golden yellow in autumn. 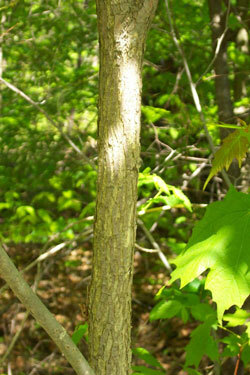 The bark is light brown, thin, and finely fissured into long, narrow scaly ridges. In early spring, the ironwood boasts tiny flowers which appear prior to the leaves. Nutlets and buds are eaten by wildlife including bobwhites, pheasants, grouse, deer, and rabbits. The tree's name refers to the resemblance of the fruit clusters to hops, an ingredient of beer. It is called "ironwood" for its extremely tough hard wood, which is used for tool handles, small wooden articles, and fence posts. Sadly, it is a slow-growing tree. Watson's Bend lost a number of ironwood trees in the 2011 tornado. Image credit goes to CSC Virtual Herbarium. Assistance in identifying plants was given by Dr. Carol Brooks.